Human disturbance is hypothesized to increase moose and deer abundance, resulting in more predators and increased ‘collateral’ predation on caribou. Yet the relationships between moose, deer, and caribou are also influenced by other factors such as climate change, weather patterns, or natural habitat attributes. 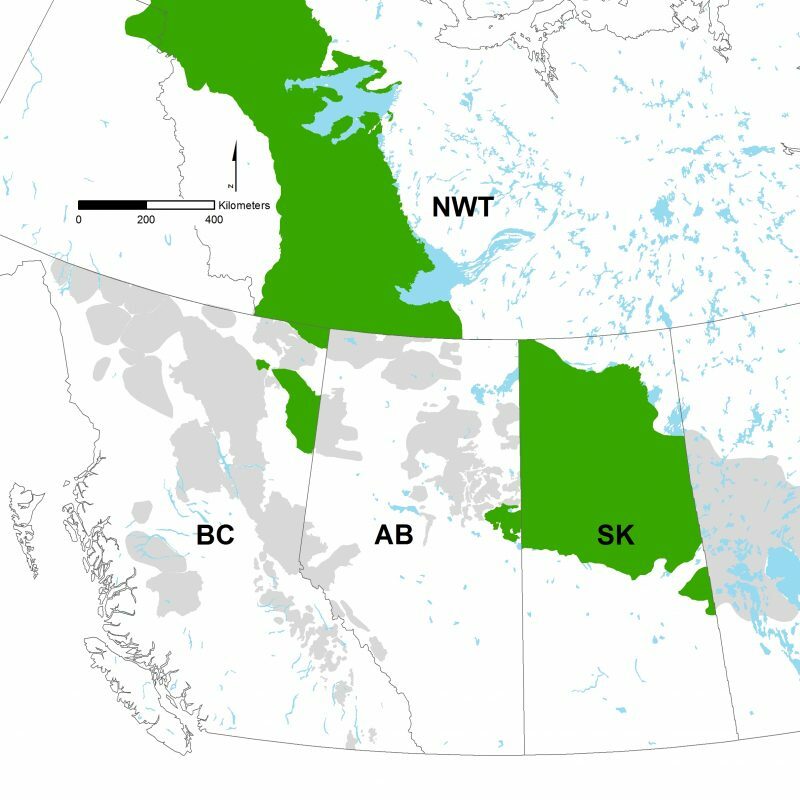 A program was initiated in 2014 to address the relative influence of human footprint, climate, and natural habitat composition on the abundance of moose, wolves, and caribou in collaboration with the British Columbia Oil and Gas Research and Innovation Society (BC OGRIS), the Government of Northwest Territories, and the University of Saskatchewan. 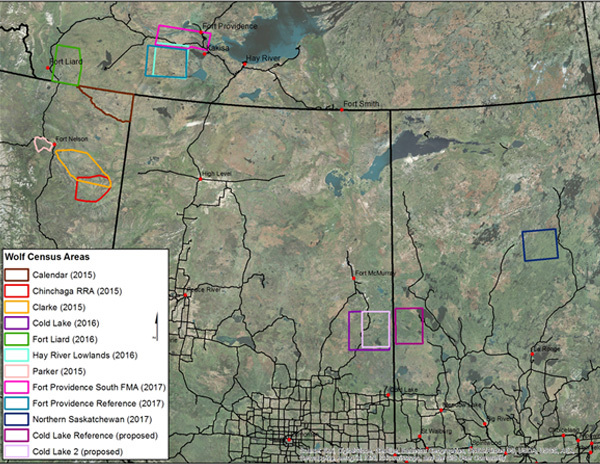 The goals for the first year of the program were to 1) pilot a cost-effective and accurate method to count wolves in the boreal forest and 2) conduct a preliminary analysis evaluating the relationships among landscape attributes, moose, deer, caribou, and wolf populations. The CMU’s wolf census areas for locations surveyed between 2014 and 2017. The relative importance of human footprint and the amount of wetland habitat were compared to determine which factor had more influence on wolf density and caribou population growth rate (lambda). As wolf density increases, caribou population growth rate decreases. Wolf density increases in areas with higher human footprint. Caribou population growth rates decrease in areas with higher human footprint and wetlands were negatively related to caribou trend; these were similar in their ability to explain differences in caribou trend. The sampling design captured high variation in wolf densities, human footprint, and land cover, which will facilitate future analyses. By directly relating spatial factors to population parameters (e.g. growth rates and abundances), the approach provides an explicit assessment of the apparent competition hypothesis, the prevailing paradigm for explaining widespread declines of woodland caribou. We will apply methods developed in the pilot program to conduct more surveys to increase sample size and provide data to further evaluate the links between landscape attributes, prey, and predators. The full report, including methods, can be found here.